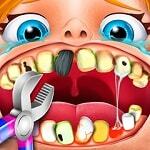 Did you sometime want to become the real children’s dentist? In this game you have an opportunity to try this profession. Come to the house to treat to children teeth and accumulate experience!